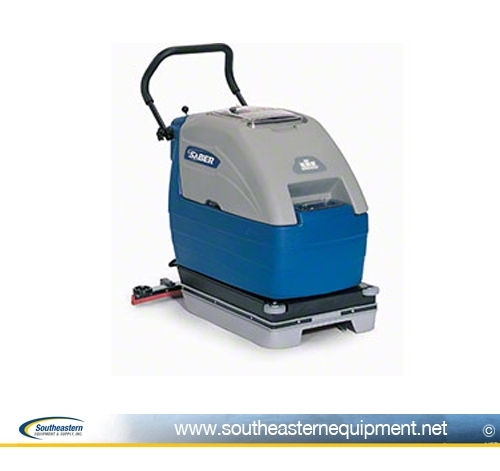 Reconditioned Windsor Saber SC17 Floor Scrubber 17"
If you are looking for a compact and easy floor scrubber look no further. The Windsor Saber Compact 17 brings big performance in a small package. Unit has an 8 gallon solution and 10 gallon recovery tank along with a 17” cleaning path. Units come fully reconditioned with new batteries, Vacuum motor and all gaskets, filters, casters, squeegees and brush or pad driver. Simple controls make this a perfect choice for small to medium size jobs. On-board charger enables the operator to charge the machine quickly and easily. Large capacity solution and recovery tanks increase productivity. Simple, efficient vacuum system that completely dries the floor. Pad/brush assist propelling system increases productivity. Adjustable handle for comfortable use by any operator.